A little bit of weather should never stop you having a good time - with the Orangery, you can enjoy all the benefits of a garden indoors. All winter long! Hit back, relax, and enjoy a nice hot cup of tea as butterflies dance around you and birds chirp in the trees. It may be getting colder outside, but that doesn't mean you can't enjoy some garden delights! Effective immediately, the Orangery can be purchased in the shop for 70 Gems. 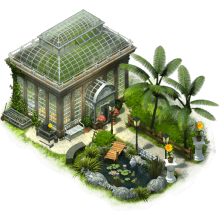 More than just your average greenhouse, this brand-new hidden object building requires neither a building permit nor a minimum number of customers and never needs to be repaired. Its slots generate either Coppers or experience points, alternating with each slot you unlock (much like the Hotel or Spa).